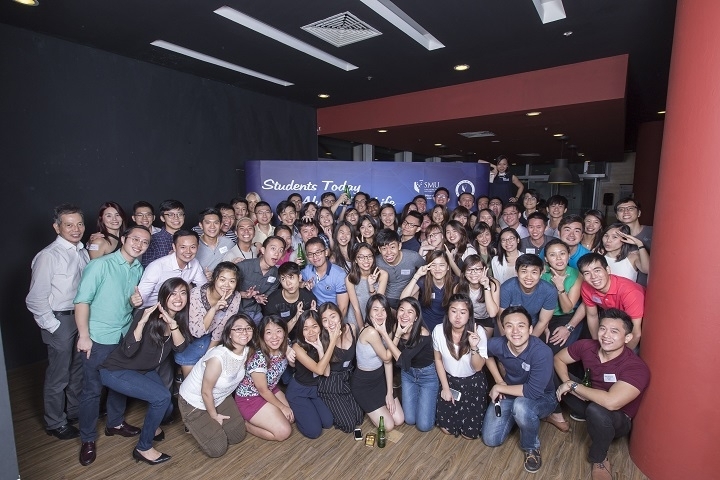 It was like a large family gathering as generations of SMU Ballare alumni came together to celebrate the launch of Ballare Alumni Group on 2nd December 2016. Over 80 alumni gathered at the Basement in SMU Concourse to commemorate the event as the University welcomes its 32nd alumni group to the SMU community. Not a stranger to the SMU Ballare family, Director of SMU’s Office of Alumni Relations Associate Professor Low Aik Meng welcomed the crowd and thanked the instructors Melvyn and Nancy Low (pictured above). Spanning across 10 batches, past and present students in the SMU Ballare come under the tutelage of Melvyn and Nancy - both of whom are professional standard ballroom dancers and founders of Melvyn Low Dance Studio. Melvyn and Nancy have won numerous dancing competitions together and with more than 100 couples of ballroom dancers under them, they are Singapore's biggest ballroom dancing school. Since the studio’s inception 21 years ago, Melvyn and Nancy focus on training up competitors to represent Singapore as well as choreographers and performers for many different performances all around Singapore. President of the SMU Ballare Alumni Group Soon Kian Yong (BAcc, BBM, 2012) (above) addressed the group and introduced the Executive Committee comprising Vice President Daniel Pang (BSocSc, 2014), Secretary Yap Zhi Xin (BSc (Econs), BBM, 2011), Public Relations Director Soon Kian Keong (BBM, 2016), and Dance Advisor Shanelle Gooi (BBM, 2011). Recalling the accomplishments at local and overseas competitions, championships and performances, Kian Yong spoke fondly of the best memories created over the years with deep friendships forged and life partners found amongst the SMU Ballare members. Vice President Daniel Pang presented on the upcoming plans for the Group with many members looking forward to performances, dance classes and the annual dinner and dance. Everyone got together for a massive group photo and participated in an impromptu mannequin challenge. We look forward to more activities and happenings from this newest alumni group! View the Facebook album for more photos from the event. Visit the Group’s website for more information on the SMU Ballare Alumni Group. The SMU Alumni Groups are niche communities for alumni formed under the SMU Alumni Association (SMUAA) and supported by the Office of Alumni Relations (OAR). The groups are formed under school-based, interest-based, programme-based (or postgraduate) and affinity alumni groups. These individual alumni groups receive funding from SMUAA to conduct at least two engagement events a year. OAR will facilitate the establishment of new alumni groups, spearheaded by either alumni or faculty.